Its been really unfortunate thing when you forget your Android phone’s pattern lock / security PIN or password and hence unable to unlock it. There are plenty of guides available that indicate hard resetting or wiping the data from recovery mode as the foremost solution to unlock Android device. Although resetting method erases data from phone but will not void phone’s warranty. Perhaps there is another way around that helps to reset forgotten pattern lock / security PIN / password from your Android device without having to lose your precious data. Dr. Ketan from XDA Developers forum has developed an intelligent hack file, that needs to be flashed on your Android device through custom recovery and bingoo!! your phone’s security code / pattern lock and password will be removed. This hack basically instructs your phone to remove password.key & gestures.key files from /data/system/ folder, thus resetting Android’s security. Ketan has basically developed this hack / tweak to unlock his Samsung Galaxy Note 2. So this tweak will probably work with most of the Samsung’s Devices including, Galaxy S 2, Galaxy S 3, Galaxy S 4, Galaxy Note 3. This tweak / hack has also been tested with some of HTC and Sony’s Android devices and it worked like a charm. 1. Your Android phone needs to have a custom recovery installed on it. (If you don’t have it installed, please Google search for either CWM or TWRP custom recovery for your Android phone with your phone’s Android version and flash it while booting your device into Download Mode). TWRP recovery has plenty of options to play with. 2. Download & Copy This ZIP file (LockScreen_Security_bypass.zip) into your Phone’s internal storage. 3. Once custom recovery is there on your Android phone. Boot it into custom recovery mode (process to boot into recovery mode varies for different device manufactures) For Samsung’s devices it is Home Key + Power Key + Volume Up key –> Hold these three keys until your phone boots into custom recovery mode. If you have device from any other manufacturer, please make a Google search to seek the key combination to boot it into recovery mode. 4. Now you have to select Install ZIP option from custom recovery mode and choose LockScreen_Security_bypass.zip file from your phone’s internal storage and hit OK. This will flash the hack / tweak to reset your Android phone’s security PIN / pattern lock / password. 5. Turn off your device and upon restarting you will see that there’s no security PIN / password, however if you are still able to see a pattern lock screen, draw any random pattern on it and it will be successfully unlocked!! Now you must choose and set another password / security PIN / pattern lock as per your choice. Make sure you have installed Android SDK and your Android device has root access enabled. Enter the following commands through command prompt and it will remove your Android phone’s security PIN / password / pattern lock in the manual way. 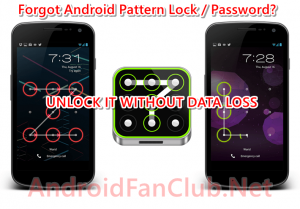 If the data inside your Android device’s internal storage is not of important nature, you must probably try the Easier Way to Reset Pattern Lock on Android.